Mental health is everyone’s business. Research has shown that 1 in 5 Australians will experience a mental health issue in their lifetime, and over the course of a generation, half of the population will have some reduction in their mental health status. It’s important for everyone to develop skills in recognising and responding to someone who is struggling with mental health issues. October 8-14 is Mental Health Week, a national event that aims to improve community awareness and knowledge about mental health illness and reduce the stigma and discrimination associated with mental health problems. We have a number of upcoming workforce development short courses focused on mental health. What comes to mind when we think of first aid, CPR, or attending to minor workplace injuries? Would you know what to do if you were faced with someone having a panic attack, behaving aggressively (perhaps because of alcohol or drugs), or appearing suicidal? This two-day, internationally recognised course will provide a basic understanding of some of the most common mental health problems affecting Australians. You will learn about some of the signs and symptoms that may indicate someone is mentally unwell, and what to do if you are faced with someone experiencing a mental health crisis. Learn about the ‘why’ of suicide, warning signs, risk factors and effective engagement, building resilience and protective factors for our communities. Knowledge from this course will help you to reach out effectively and confidently to intervene in a suicidal crisis. Suitable for workers in any profession. This four-hour course is designed to teach you how to give first aid to someone that is feeling suicidal. 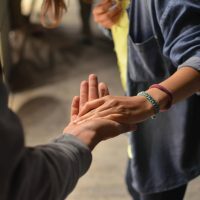 You will learn the three steps – Ask, Keep Safe, Connect – to prevent suicide. Mental Health First Aid certificate is not required to complete this course. Certificate of Attendance awarded on completion.